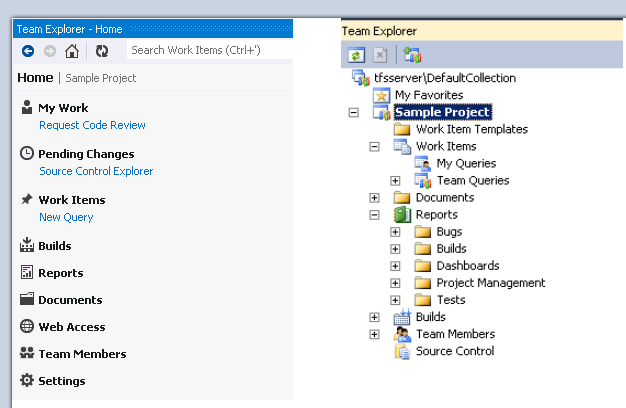 Visual Studio 2012 drastically changed the Team Explorer. Not only the UI Changed a lot. Also the way of working within Team Explorer changed. Team Explorer now has the notion of a “My Work” tab, that displays all relevant information to you. It displays In progress Work Items, Available Work Items, Allows you to Request a Code Review etc. Team Explorer is “Task-Centric”, which means that you can indicate where you want to work on. If you select a task, this task is automatically related to other things you do. For example Suspend work, Shelve changes or check-in changes. You can set the scope (select the task you want to work on) by dragging it from “Available Work Items” to “In Progress Work Items”. But…..not everything is in “Available Work Items”. Available work Items default only shows “Task” work items in the ToDo state that are assigned to you in the current sprint. This means it does not show bugs, PBI’s. So…Are you now required to have tasks. You can of course create your own view. Here you see the query and the criteria. Was directed to this post for my issue posted on msdn (http://social.msdn.microsoft.com/Forums/en-US/tfsgeneral/thread/785898d1-75b2-4caf-aa44-4dfdc4a27799/). Indeed it answers it, but now I wonder: can I also get this working when I store the query under “Shared Queries”? In short. I think you cannot. Is it possible to modify existing query instead of creating new query in My queries?